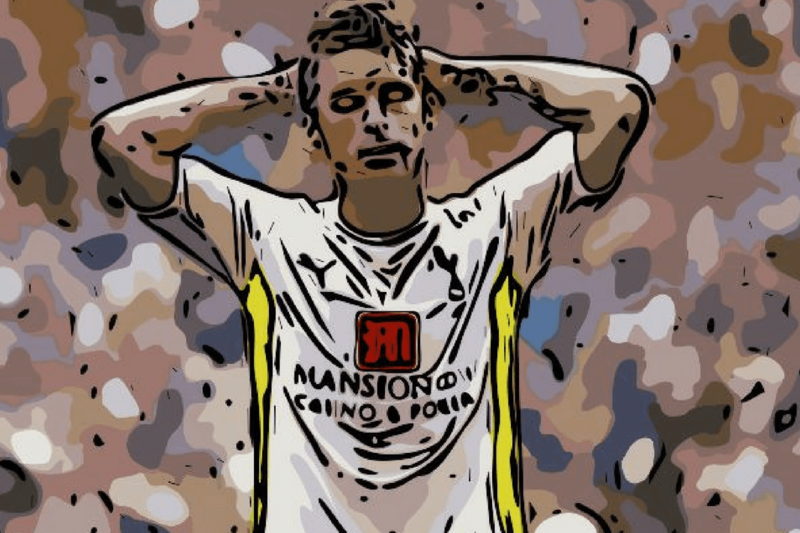 David Bentley has enjoyed a plethora of magnificent moments during his career. The kid from Peterborough grew up training with the golden age of Arsenal players, he scored an astounding hat trick against Manchester United for Blackburn, and scored that goal for Spurs against Arsenal in the bizarre 4-4 match in 2008. All of these achievements helped the player earn a number of England caps, while pundits billed him as “the next David Beckham“. High praise and big pressure for the self assured winger. Bentley had the potential to go right to the top, so what happened? What made the winger move to Russia for a few months? And what made this England international finally hang up his boots at the premature age of 29, injury free, when your average player is in their peak? The answer is simple. He fell out of love with the game. He may have fallen out of love with the game, but his early years in football were nothing short of a dream for young David Bentley. He may have grown up a Manchester United fan, but that didn’t stop him from being signed up to the Arsenal academy at the age of 13. He joined as a striker, though was moulded into a winger over the years. At the age of just 16 he was invited by Arsene Wenger to train with the first team in 2001. He learned his craft with an incredibly talented group of players who went on to win the league that season, including Thierry Henry, Robert Pires and Patrick Vieira. At heart he was a Red Devil, but being able to play alongside these herculean players in training was an unforgettable experience. Training with the senior Arsenal squad was a dream for Bentley, but a year and a half later he went a step further. 77 minutes into an FA Cup game against Oxford United, the 18 year old was brought on for Kolo Toure to see out a 2-0 victory. This was Bentley’s only outing in 2002/03, though the 2003/04 season turned out to be an important one for the winger. Bentley was used mainly as a cup player in 2003/04, building on the 13 minutes that he mustered the previous year. He played four times in their League Cup run to the semi final, and twice in the FA Cup. It was the FA Cup where Bentley scored his first and only goal for the Gunners. They were 3-1 up at home to Middlesbrough and in the 90th minute, David received a pass just outside the Boro box. The winger noticed that Mark Schwarzer was off his line and attempted an audacious chip that managed to clear both the goalkeeper and multiple defenders. His celebrations were certainly not that of a player who didn’t care. In May 2004 Bentley finally made his first Premier League appearance in a game against Portsmouth. Bentley was loving the opportunity to learn from his Arsenal team mates. Thanks to his appearance against Pompey he was now an Invincible, but he knew that he had to leave. Training with the best was important, but he needed game time and he wasn’t willing to wait for the odd cup appearance. He requested a loan move and found himself a regular for Norwich City. A knee injury hampered his playing time during the winter period, and Norwich were relegated from the division, but he could consider his time with the Canaries a success on a personal level. He got the game time he desired, and developed a taste for regular football. He needed the football to distract him. Off the field he was troubled. It came out years later that Bentley suffered from a crippling gambling addiction. In the height of this illness he was placing upwards of a hundred bets a day. He felt he was successful, though realised that he was on the verge of being out of control, able to save himself from the abyss with help from those closest to him. He left Arsenal on loan as a raw winger full of potential, but he returned having matured and crafted his game. He may have been able to become a more established player at Highbury, but he didn’t want to take this chance. He was uncomfortable not playing regularly and didn’t feel as if he was really part of the star-studded team. He went on loan to Blackburn. After a strong six months at Ewood Park, the Lancashire outfit made the move permanent in January 2006. Bentley may have started at Arsenal, got his break at Norwich and made his money at Spurs, but it was his three year spell at Blackburn Rovers where Bentley shone. Just days after making his loan move to Rovers permanent, Bentley lined up to face Manchester United at Ewood Park in a truly unforgettable game. His first goal was a rebound from a Morten Gamst Pederson free kick. Bentley’s second of the game came even easier than the first – a mix up between van der Sar and a dreadlocked Rio Ferdinand saw both players leave the ball, allowing the star of this article to tap the ball over the line with ease. If goals one and two were fortunate, goal number three was sublime skill. A spectacular overhead kick pass from Robbie Savage (yes, really…) usurped Wes Brown and allowed Bentley to hammer the ball beyond the keeper to seal the points. Things got better and better for David Bentley as Blackburn qualified for the UEFA Cup at the end of his first season there. He enjoyed a fine European campaign, scoring the goal against Salzburg to which secured Blackburn their place in the group stage. In their opening group match, he scored a last gasp winner against Polish side Wisla Krakow to set them off in good standing for qualifying for the knockout round. Blackburn were knocked out in the round of 32 by Bayer Leverkusen, but it was good progress by Rovers and good experience for their star winger. This UEFA Cup adventure, on top of an excellent league campaign, drew plaudits from fans and pundits, with Manchester United supposedly eyeing up the player. Despite the attraction from the Old Trafford outfit, Bentley put paper on a bumper new deal at Blackburn, committing himself to the club until 2011. He stated in an interview years later than what he loved most about the club was the atmosphere, how everyone had a great team spirit and that he felt a bond with the players. They were a bunch of characters. Guys like Robbie Savage would act as a wind up merchant, he said it was fun to play and it was fun to be involved. In the summer of 2008, Bentley decided to take a step up to the next level by signing for Tottenham Hotspur. He came out years later saying that he regrets his part in the transfer, saying that he and his agent were perhaps quite forceful in trying to push through the move. Despite some moderate success, it was at Spurs where his career began to derail, in no small part due to the lack of comradeship that he enjoyed at Blackburn. Bentley’s Spurs career started off well. Despite losing on his debut against Middlesbrough, he recovered. Two years after scoring against Wisla Krakow for Blackburn in the UEFA Cup, he did it again for Spurs in the qualification round. Bentley endeared himself even more to the fans at White Hart Lane in the North London derby. 13 minutes in, the ball fell to Bentley over 40 yards from goal. He took one touch to set the ball up without letting it touch the ground, before blasting it over the defence and beyond the outstretched arms of Arsenal keeper Manuel Almunia. The game ended 4-4, a thrilling start to Harry Redknapp’s Tottenham career, and it certainly was a game for the ages. While Spurs did not win the match, their dramatic late equaliser felt like a win for a down on their luck side, and Bentley’s magical strike was very much something to cheer for. Spurs were engulfed in a fiercely contested battle with Manchester City to earn the final Champions League spot for that season. In the penultimate round of fixtures in the season, Spurs travelled up to the Etihad in what was effectively a winner takes all encounter. Spurs won 1-0 thanks to a late Peter Crouch goal, one which earned Spurs their first ever Champions League place. During the celebrations, Harry Redknapp was giving his post match interval when an ecstatic David Bentley, accompanied by a few team mates, took it upon themselves to throw a bucket of ice water over their manager, live on television. Redknapp laughed it off, but it was obvious that he was livid. ‘Arry never publically slated Bentley for his hijinx, but he mentioned years later that he found this horribly disrespectful. As such, Bentley only played a couple more games for Spurs as he was phased further and further out of the team. He spent the next few years bouncing around a number of different teams: Birmingham in the Premier League, West Ham in the Championship and then FC Rostov in the Russian Premier League. None of these moves brought about any success, a knee injury at West Ham being a particular low point. In a move bordering on desperation in January 2013, Bentley rejoined Blackburn on a short term loan deal. He was looking to recapture his form from his previous time with Rovers, while Blackburn were hoping that the player would rise to the occasion to lift them back to the top flight. This did not work out for either party. He played a handful of games for Blackburn, but after a particularly disappointing game away to Cardiff, he was subbed off. As he trudged off the field he said to himself that it was over. He was done. And he stuck to his word. He was released a year early from his bumper six-year contract at Spurs and was clubless during the 2013/14 season. That Cardiff away day really was Bentley’s last game of professional football, but why? Why did he give it up? He hadn’t done anything to earn himself a black mark against his name. His injuries weren’t career threatening. He was far from a saint, but his gambling problem was in his rear view mirror and his drinking was hardly an issue. So what made this gifted footballer retire? Why did the “next David Beckham” just throw in the towel? The answer is both remarkably simple whilst still being sad and complex. The main reason that David Bentley retired from football is that he just lost the love. When he was plying his trade at Norwich and at Blackburn he revelled in the camaraderie of the changing room. He felt that at Spurs this was less so, and the older he got, the more he tired of the egos. He claimed that social media was ruining the atmosphere. He has no desire to read what every fan in the stadium thought of him, nor did he enjoy spending the pre game sitting in a silent room as his team mates sat on their mobile phones. He just felt disconnected from what he loved and decided that if he didn’t enjoy it then why bother. He had made a good amount of money and had a good head on his shoulders. David Bentley the footballer was a thing of the past. Mr Bentley the businessman was on the horizon. Since retiring he has moved himself and his family out to Spain. Bentley and his agent, along with a couple of friends, got involved with a bar in Marbella, Spain, called La Sala. It is certainly a very different environment to the glitzy life of a Premier League footballer. It is a highly reputable resort and the smooth talking Englishman is evidently doing well for himself out there. The company has branched out and now have a bar in London. When so many footballers come out of football physically and mentally exhausted, lost with their next move, it is refreshing to see Bentley so driven and motivated to get his business off the ground. And that is the story of David Bentley. A player with dazzling talent on his day, who simply lost the love. He has been involved in some iconic Premier League moments, his Manchester United hat trick and his wonder goal against Arsenal instantly spring to mind when Bentley is brought up. But as the years rolled on, the love went. He said in an interview with Fletch and Sav on BT Sport years later that he absolutely loved football as a game, but that it was the robotronic atmosphere and lack of fun in the changing room that killed it for him. He said that he has no regrets about his decision to quit and that he is extremely happy with how things have panned out for him. He may not have become the new David Beckham, but he was a solid Premier League player for nearly a decade, and that is nothing to be turned down. Bentley may have fallen out of love with football, but football never fell out of love with David Bentley. If you enjoyed this article then you can follow myself on Twitter @Jack_Wills_95, as well as the work of the wonderful Tale of Two Halves team @Taleof2_halves.